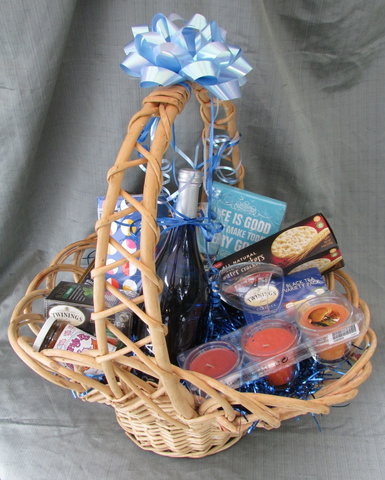 This basket contains everything you need to unwind from whatever stress afflicts you. (Well, maybe not tickets to Tahiti….) Soothing candles, crackers upon which to spread preserves & pumpkin butter (! ), napkins, and wineglasses in which to enjoy your very large bottle of Relax brand wine. The graceful basket can then be used to make more relaxing occasions.